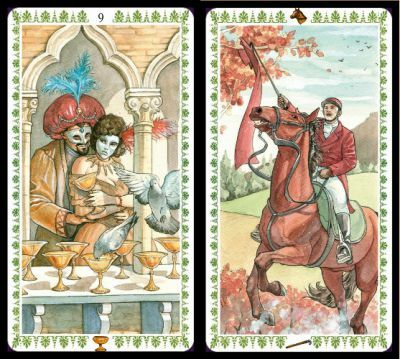 The Romantic tarot has been designed by Emanuela Signorini and illustrated by Guilia F. Massaglia. Romanticism brings us back to the Victorian era. The four suits are linked to main Continental European cities: Paris (wand), Vienna (sword), Venice (cup) and Roma (coin). The trump cards are not named, just numbered with Roman numerals, and the scenes are from the selected four cities. About this pack, I would say not outstanding but charming. Those who were tempted by the Mucha Tarot last year (same editor and artist) will certainly appreciate the Romantic one. Price and where to find: About € 20 with a 64-page companion book.